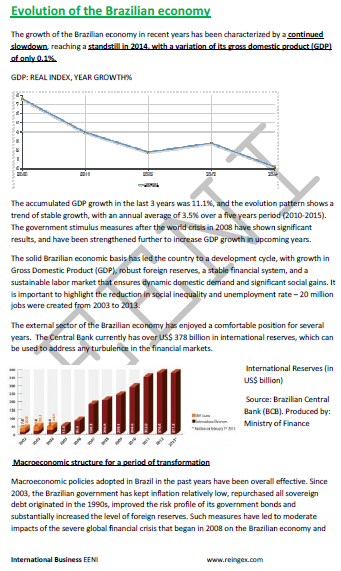 Syllabus of the Online Course (Subject): Brazilian Economy. Industrial and services sector in Brazil. Description of the Online Course: Brazilian Economy. Industrial and services sector in Brazil. Brazil is the largest market in Latin America (accounts for 50% of South American economy). Brazil has twenty-six States and one Federal District, placed in five regions. Distribution and sales representation are, in most cases, cost saving when compared to the incorporation of a local branch or affiliated company. However, these alternatives may bring a lack of control to foreign investors over the way the third parties distribute or sell their products in Brazil and deal with their Trademarks. International Paper was formed in 1898 and, with Union Camp (1999) and Champion International (2000); it is the biggest company of paper and forest products in the World. The administration world is placed in the United States, in Stamford, CT. The company has operations in fifty countries in the American continents, Europe, and Asia, and exports to 130 countries. Gerdau Group occupies the position of the largest long steel manufacturer in the Americas, with steel plants distributed in Brazil, Argentina, Canada, Chile, the United States, and Uruguay. Today, reaches a total installed capacity of 14.4 million tonnes of steel a year. Gerdau Group keeps a presence in the international market exporting high products and special common to all continents. For Gerdau Group, is an international, world-class, not just be present in a wide geography. Natura Company was born in Brazil and bears the mark as proud and legitimate expression of their origin, but their engagement is greater with the human being, with the welfare and the individual and society, anywhere. So, go in search for new crops, bringing his vision of the World, exchange experiences, learn, create new roots and relations is part of its history. Sources: Brazilian Government. Brazilian Institute of Geography and Statistics.